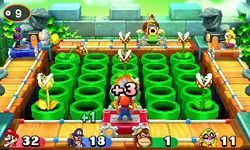 Piranha Plantemonium is a free-for-all minigame in Mario Party: Star Rush. The name is a combination of Piranha Plant and the word "pandemonium". Players need to aim for Piranha Plants and shoot bullets at them. Regular Piranha Plants give one point and Gold Piranha Plants give three points. Sometimes, a giant Golden Piranha Plant can appear with a life bar and the player who defeats it earns ten points. If players are hit by their opponents bullets, they are stunned for several seconds. At the end of the minigame, the player with the most points wins the minigame. "Shoot down the Piranha Plants!" This page was last edited on August 12, 2018, at 05:33.